Get on top of the metallic trend early for a sparkling party season. Models from the Spring/Summer 14 fashion shows were sporting a range of metallic make-up looks that had us yearning for summer sun – but who says we have to wait until the warmer months to try this trend? The easiest way to embrace the metallic trend is through a shimmery eye. For a bold look you can try cream-formula eye shadows that pack a glittery punch. For a more subtle take on the trend, apply a light dusting of glitter on the inner corners of your eyes or experiment with metallic eye liners. Tip: Keep your lips neutral and matte for a sophisticated look. Another great way to adopt the trend is through a metallic manicure. Rose golds and bronzes are particularly flattering and look great with almost all colours. Tip: If your party dress is covered in bling, you may want to avoid an overly glittery nail. Adding a clear shimmer to your lips adds a sense of occasion for every day, and if you really want to stand out – a high-shine colour will do the job. Tip: Bold coloured lips look great with simple 60s-inspired eye liner. Bobbi Brown Sequin Shimmer Brick Palette (£34.50) – 10 shimmery shades in one palette. Mac Dazzleglass (£17.50) – Bright colours with a hint of sparkle, the perfect party pout. 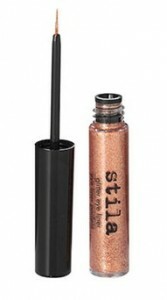 Stila Kitten Glitter Eye Liner (£10) – We love this rose gold colour for a chic metallic eye. Topshop Nails in Gilted (£6) – The perfect colour to make your LBD pop.